Olympia's Stroller Strides classes through Fit4Mom are a great way to get back into shape while connecting with a community of parents. Pregnancy is a funny thing. 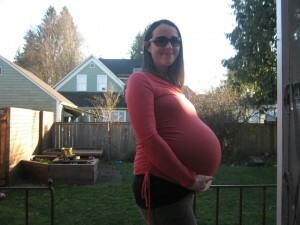 When I was around 27 weeks pregnant with my first child, people started making the comments. They asked if I was expecting twins or would comment that I must be due any day now. I was not pregnant with twins, just one (plus sized) baby. The truth is, I was not one of those pregnant women who “worked out.” Maybe just a little prenatal yoga now and then, but overall I felt that the safest thing I could do for both me and my baby was to spend plenty of time on the couch eating chocolate cake. This theory earned me both a healthy 9-pound baby girl and a whopping 65 pounds of pregnancy weight. It takes at least nine months to grow a baby, so count on nine months (or more) to get your body back. Lucky for me, nursing and moderate post-partum exercise helped me lose the weight just in time to get pregnant with baby number two and do it all over again. And again and again. Four babies later, I am still on the lookout for great post-baby exercise that is safe and fun for both mom and babe. I have divided my top picks into three categories: best workout to do solo, best workout to do with your baby, and best workout with nursery care option. If you are lucky enough to have a partner at home with whom you can leave your little one, or someone else in the proverbial “village” steps up to help out, you might want to consider swimming as a fabulous post-partum workout. Sarah Applegate, a swim instructor at The Valley Athletic Club, has been a water safety instructor, competitive swimmer, and swim team coach for most of her adult life. After giving birth to her daughter, Applegate swam to get back into shape and gently ease back into exercise. “Swimming is easy on joints and ligaments that have been challenged by childbirth,” Applegate asserts. So she took to the pool after giving birth to daughter, Marieka, and used this gentle workout as a jumping off point for more vigorous exercise. The Valley has two indoor and two outdoor pools and if individual lap swimming is not motivating enough for you, sign up for one of their water aerobics classes. As someone who gained a lot of weight during pregnancy, I can attest that swimming is a great way to lose the weight without putting even more stress on your body. 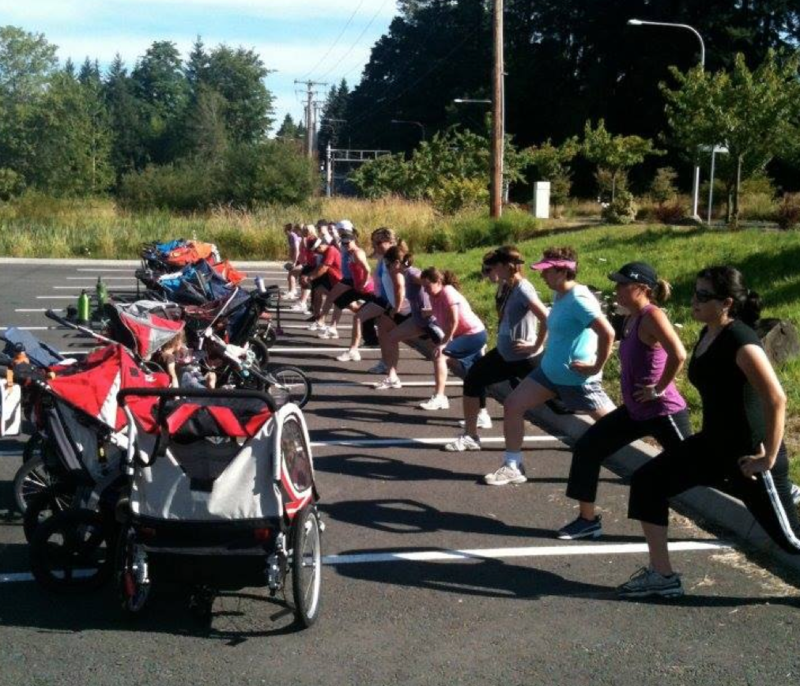 Olympia’s Stroller Strides classes through Fit4Mom are a great way to get back into shape while connecting with a community of parents. Kim Bauer has been running Fit4Mom in Olympia for the past five years. 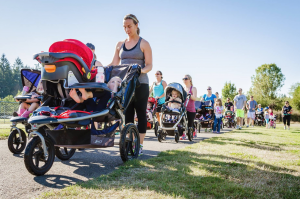 The program offers the widely popular Stroller Strides class that you have probably seen zipping around Capital Lake on sunny Saturday mornings. Stroller Strides is a very unique post-partum workout for new moms (and dads!) because the entire activity is completed with kiddos in tow. She went on to explain that, while the workout is intense, it is also thoughtfully geared towards new moms. “When we do jumping jacks, we also do nursing mom jacks,” Bauer concluded with a laugh. However, Bauer is quick to point out that the workouts are also individualized to the client. In addition to the Stroller Strides classes, there is an eight week intensive class called “Body Back” that offers nutrition education along with exercise for newer (and older) moms. The locations for classes vary so be sure to check out the Fit4Mom website and Facebook page for locations and times. There are many options for post baby workouts in Thurston County. Find the one that works for you and your kids. One of the truly unique features of this fun, family owned gym is the child care. When I brought my daughter to the child care at CrossFit Lacey Training Day for the first time, I was a little nervous because my youngest is a bit of a hard sell on nurseries of any kind. I was happily surprised by the wide open, sunny, and safe area for babies and children at the gym. The attentive, enthusiastic women who staff the child care quickly convinced my daughter that she was going to have a great time, and I was able to sneak away for a CrossFit workout. As Knighton puts it, “Our childcare room is amazing. It is run by other mothers and we do fun age appropriate art, crafts and games.” After completing my workout, I returned to the nursery to find my daughter happily finishing up a Mother’s Day craft for me. Probably the most noteworthy aspect of CrossFit Lacey Training Day’s amazing child care facility is that they take infants. Trust me (and every other new mother who has wanted to work out at a gym) when I acknowledge that this is both unusual and awesome. Many gyms only accept kiddos who are walking, but CrossFit Lacey takes them as young as six-weeks-old. And all doctors and midwives advise waiting a minimum of six weeks post-partum before starting exercise anyway, so as soon as you are able to hit the gym, the lovely people here are ready to nurture your new little one. Check out their Facebook page or website for up to date class offerings and times. In my opinion, a body that has grown and birthed a baby is one deserving of much respect, rest, and (more) chocolate cake. But when you are ready to get up off the couch and start working out again, pick a style that works for you and your kiddos and get to sweating.